This is a recipe that the illustrious Jean-Georges Vongerichten created for Food and Wine. 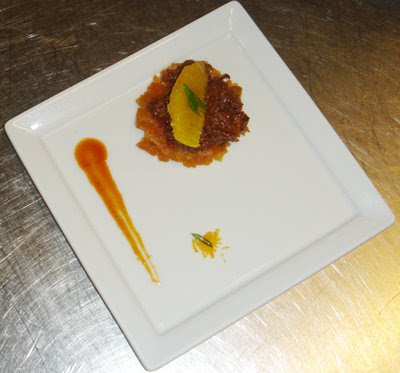 We adapted it to canapé size at school and used shredded osso bucco instead of short ribs. It was served atop tostones and garnished with orange suprêmes and chives. Señor O tasted the leftovers and it was love at first bite. JGV’s slick sauce is ridiculously easy to make and is highly adaptable – I use pork, because it’s the white meat in this household, but I think it would be equally brilliant if used to shellack that other white meat: chicken. It’s finger lickin’ fantastic, natch. The sweet and tangy orange sûpremes made a comeback as a topping, but I replaced the aforementioned chives with cilantro and piled the whole thing onto freshly made corn tortillas to give it some Latin flair. See below for the adapted recipe, and visit Food & Wine for the original. In a large bowl, mix the ketchup, wine, vinegar, molasses, onion flakes, fish sauce, soy sauce, garlic powder, chipotle, sesame oil and 1 tablespoon of salt. Whisk in the water. Generously season the pork loin with salt + pepper. Heat on high a pot large enough to accommodate the pork loin and the three quarts of liquid that you’ll be adding. Add about 2 tsps. vegetable oil to the heated pot and allow to heat through, about 30 seconds. Add the pork loin and sear, browning on both sides. Degrease the pot and return browned loin. Add the sauce and bring to a boil. Reduce heat to low and allow the pork to simmer, covered, until tender (approximately 1 hour). Once pork is cooked through, remove from the pot and when cool enough to handle, shred. Reserve, loosely covered with plastic wrap or foil. Bring the sauce to a boil and allow to reduce about two-thirds (about 1 hour). 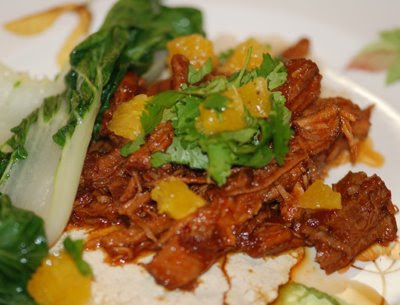 Once thickened, return the shredded pork to the sauce and simmer an additional 30 minutes. I know – it seems like a long time, but you can either start early or prepare a day in advance. It tastes just as good – and perhaps even better – a day later.